John II (Portuguese: João II, Portuguese pronunciation: [ʒuˈɐ̃w̃]; 3 March 1455 – 25 October 1495), the Perfect Prince (Portuguese: o Príncipe Perfeito), was the king of Portugal and the Algarves in 1477/1481–1495. He is known for re-establishing the power of the Portuguese throne, reinvigorating the Portuguese economy, and renewing his country's exploration of Africa and the Orient. Born in Lisbon, the son of King Afonso V of Portugal by his wife, Isabella of Coimbra, John II succeeded his father as ruler of Portugal in 1477, when the king retired to a monastery, but only became king in 1481, after the death of his father and predecessor. As a prince, John II accompanied his father in the campaigns in northern Africa and was made a knight after the victory in the Conquest of Arzila in 1471. In 1473, he married Leonor of Viseu, an infanta of Portugal and his first cousin. Even at a young age, John was not popular among the peers of the kingdom since he was immune to external influence and appeared to despise intrigue. The nobles (including particularly Ferdinand II, the Duke of Braganza) were afraid of his future policies as king. 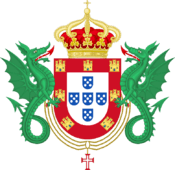 After his official accession to the throne in 1481, John II took a series of measures to curtail the power of the Portuguese aristocracy and concentrate power in himself. As one of example of the measure he took, he deprived the nobles of their right to administer justice on their estates. Immediately, the nobles started to conspire. Letters of complaint and pleas to intervene were exchanged between the Duke of Braganza and Queen Isabella I of Castile. 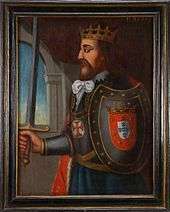 King John took the precaution of renegotiating the "Tercerias de Moura" agreement to insure that his son Afonso was living safely back at court before he would move against Braganza, the most powerful noble in the realm (the original agreement called for Afonso to live in Moura, Portugal, with his intended Spanish bride, Isabella, Princess of Asturias, as children before their marriage). In 1483, additional correspondence was intercepted by royal spies. The House of Braganza was outlawed, their lands confiscated and the duke executed in Évora. His widow, Isabella of Viseu, John's cousin and sister-in-law, fled with her children to Castile. In the following year, the Duke of Viseu, John's cousin and brother-in-law, was summoned to the palace and stabbed to death by the king himself for suspicion of a new conspiracy. Many other people were executed, murdered, or exiled to Castile, including the Bishop of Évora, who was poisoned in prison. Following the crackdown, no one in the country dared to defy the king and John saw no further conspiracies during his reign. A great confiscation of estates followed and enriched the crown, which now became the dominant power of the realm. Facing a bankrupt kingdom, John II showed the initiative to solve the situation by creating a regime in which a Council of Scholars took a vital role. The king conducted a search of the population and selected members for the Council on the basis of their abilities, talents and credentials. John's exploration policies (see below) also paid great dividends. Such was the profit coming from John II's investments in the overseas explorations and expansion that the Portuguese currency had become the soundest in Europe. The kingdom could finally collect taxes for its own use rather than to pay debts, mainly thanks to its main gold source at that time, the coast of Guinea. 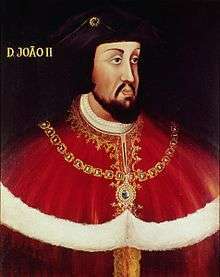 King John II in Chronica d'El-Rei D. João II; Rui de Pina, c. 1497-1504. 1484 – Discovery of the Congo River by Diogo Cão. 1488 – Discovery and passage of the Cape of Good Hope by Bartolomeu Dias in Mossel Bay. 1493 – Start of the settlement of the São Tomé and Príncipe islands by Álvaro Caminha. Funding of land expeditions by Afonso de Paiva and Pêro da Covilhã to India and Ethiopia in search of Prester John land. The true extent of Portuguese explorations has been the subject of academic debate. According to one theory, some navigations were kept secret for fear of competition by neighbouring Castile. The archives of this period were mainly destroyed in the fire after the 1755 Lisbon earthquake, and what was not destroyed during the earthquake was either stolen or destroyed during the Peninsular War or otherwise lost. When Columbus returned from his first voyage early in 1493, he thought of first stopping in Lisbon to claim his victory in front of King John II. King John II's only response to this was that under the Treaty of Alcáçovas previously signed with Spain, Columbus's discoveries lay within Portugal's sphere of influence. Before Columbus even reached Isabella I of Castile, John II had already sent a letter to them threatening to send a fleet to claim it for Portugal. Spain quickly hastened to the negotiating table, which took place in a small Spanish town named Tordesillas. A papal representative was present to act as mediator. The result of this meeting would be the famous Treaty of Tordesillas, which sought to divide all newly discovered lands in the New World between Spain and Portugal. The division of the world, however, was not the main issue that poisoned relations between the Iberian kingdoms. Isabella I of Castile and Ferdinand II of Aragon had several daughters, but only one feeble male heir: John, Prince of Asturias. The oldest daughter, Isabella of Aragon, had been married to Afonso, Prince of Portugal, since childhood. Afonso was John II's only son and beloved by the king. If Ferdinand died without male heir, as was probable, Afonso would be the heir not only to the throne of Portugal, but also to those of Castile and Aragon. This threat to Castilian and Aragonese independence was very real, and the Catholic Monarchs tried every diplomatic trick to dissolve the wedding. Finally, in 1491, Afonso died in mysterious circumstances: a fall from a horse during a ride in the margin of the Tagus river. The influence of Isabella and Ferdinand in this accident was never proved, but the prince was an excellent rider, his Castilian valet fled, never to be seen again, and after this, Isabella, the heiress, was no longer married to Castile's enemy. John tried without success until the end of his life to legitimise Jorge, Duke of Coimbra, his illegitimate son. John II died at Alvor at age 40 without legitimate children. He was succeeded by his first cousin Manuel I. The nickname the Perfect Prince is a posthumous appellation that is intended to refer to Niccolò Machiavelli's work The Prince. John II is considered to have lived his life exactly according to the writer's idea of a perfect prince. Nevertheless, he was admired as one of the greatest European monarchs of his time. Isabella I of Castile usually referred to him as El Hombre (The Man). to render you thanks on behalf of all who belong to this century, which now favours of your quasi-divine merits, now boldly competing with ancient centuries and all Antiquity. In the TV series Christopher Columbus (1985) he is played by Max von Sydow. In the film Christopher Columbus: The Discovery (1992) he is played by Mathieu Carrière. He appears in Civilization IV (as João II), leading the Portuguese. Infante Afonso 18 May 1475 13 July 1491 Prince of Portugal. Died in a horse riding accident. Because of the premature death of the prince the throne was inherited by Manuel of Viseu, Duke of Beja, son of Ferdinand, Duke of Viseu, who reigned as Manuel I, 14th King of Portugal. Jorge 21 August 1481 22 July 1550 Natural son known as Jorge de Lencastre, Duke of Coimbra. Brites Anes de Santarém c. 1485 ? Natural daughter. 1 2 "Prestage, Edgar. "Portugal." The Catholic Encyclopedia. Vol. 12. New York: Robert Appleton Company, 1911. 30 Jul. 2014". Newadvent.org. Retrieved 2014-08-26. ↑ ''A History of Portugal'', p. 213, CUP Archives. Retrieved 2014-08-26. 1 2 Busk, M.M., ''The History of Spain and Portugal from B.C. 1000 to A.D. 1814'', p. 80, Baldwin and Cradock, 1833. Retrieved 2014-08-26. ↑ Charles E. Nowell (1936). "The Discovery of Brazil: Accidental or Intentional?". The Hispanic American Historical Review. 16 (3): 311–338. doi:10.2307/2507557. JSTOR 2507557. ↑ J. Baltalha-Reis (1897). "The Supposed Discovery of South America before 1488, and Critical Methods of the Historians of Geographical Discovery". The Geographical Journal. 9 (2): 185–210. JSTOR 1773506. ↑ Ilaria Luzzana Caraci (1988). Columbus and the Portuguese Voyages in the Columbian Sources. UC Biblioteca Geral 1. Retrieved 17 November 2010. ↑ McKendrick, Melveena (2000). Playing the king: Lope de Vega and the limits of conformity. Tamesis. p. 55. ISBN 9781855660694. His cousin, Isabella of Castille, herself no weakling, admiringly dubbed him 'el Hombre', for all the world like some early spaghetti-western hero. ↑ Manuel Bernardes Branco (1879). Portugal e os Estrangeiros. Lisboa: Livraria de A.M.Pereira. pp. 415–417. (Translation of the latin by Teófilo Braga) "render-vos graças em nome de todos quantos pertencemos a este século, o qual agora, por favor dos vossos méritos quasi-divinos, ousa já denodadamente competir com os vetustos séculos e com toda a antiguidade."